Share a picture about FRIENDSHIP with everyone! To see other entries, please click http://dailypost.wordpress.com/2012/06/08/9009/. It’s interesting as I’m not sure if the photo was taken at dawn or in the evening. It’s lovely that an image can be interpreted in many different ways. A warm sunset is always comforting, especially with friends around. I love silhouette picture. 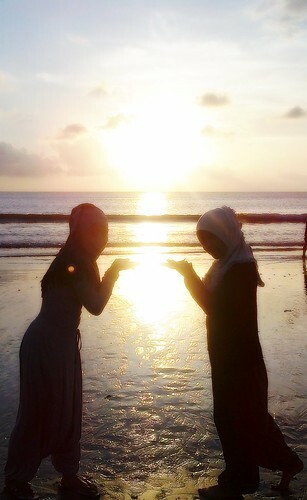 And this is great with two nice hijab girl in silhouette simbolizing picture. And it is taken in Bali? Wow, it’s a combo for me. Love it. Stunning shot, and Kuta Beach looks amazing.